In his book, Working the Angles, Eugene Peterson retells the classic story of Prometheus. In the early days of humanity, people were given knowledge of the exact date of their death. This knowledge served to cripple humanity. Knowing the precise date of their death, humans were unwilling to do more than just exist. Prometheus then decided to give humanity three things. First, he hid the date of our death from us. By this, we were left willing to seek something greater than merely existing. Second, Prometheus gave humanity blind hope. By this, we were made able to think more of ourselves than we actually are. The beggar could aspire to fortune, the slave could aspire to freedom. Third, Prometheus gave us fire. By fire, technology was opened to humanity. Humans could now cook, fire bricks and shape metals. Stuffed with these three things, humanity was set free. Today, see Prometheus as a hero who liberated humanity from slavery to the gods. I have often heard of Prometheus being upheld as a great friend to humanity because his compassion led him to better our plight. 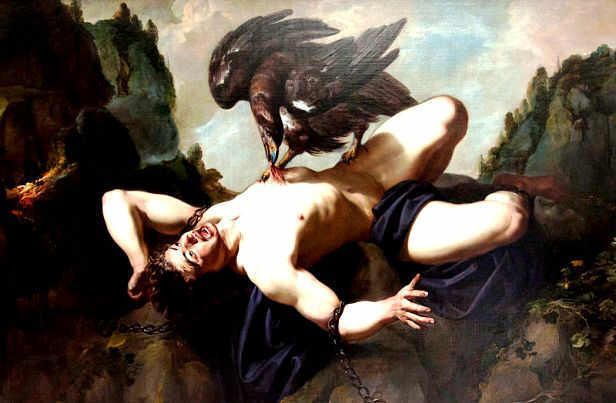 Of course the story of Prometheus is just that, a story, and yet, it does raise fascinating questions about humanity. In his Pulitzer Prize winning book, The Denial of Death, Ernest Becker argues that humans are inherently narcissistic and don’t actually believe they will die. Becker astutely observes that we tend to say we know we will die one day, but we never really think that day will come. We always think it is someone else’s child that will die in a car accident or someone else’s husband who will be diagnosed with cancer. This narcissism, says Becker, is what keeps young men walking into wars – he never thinks he will die, he only feels sorry for the guy next to him who will. To be sure, this blindness to our mortality can be beneficial, but it can also lead us to not cherish our days, our children, the family get-togethers, and the beauty of the world. The psalmist saw there was wisdom hidden in our remembering our mortality. He writes – “teach us to number our days that we may get a heart of wisdom” (Psalm 90:12). Our blind hope (the second “gift” of Prometheus) tends to be unfounded. We are creatures who strive and reach for more. We are not satisfied to just eat, we need to create delicacies and developed fine cuisine. We are not content to simply be sheltered from the elements, we want mansions and comforts like espresso makers and massage chairs. Tragically, we are not even content to be human, we strive to be God. We are not content to seek truth, we desire to define truth. Again, the question seems to be one of limits. We are limited, but we refuse to acknowledge it. The Apostle Paul pointed out the limits of humanity in 1 Corinthians 15:50 – “flesh and blood cannot inherit the kingdom of God, nor does the perishable inherit the imperishable.” Not only are our days finite (we will die), but the extend of our reach in life is limited. Strive as we might, we cannot get that which we are actually striving for. We want to live forever, we want to be remembered, but we can secure none of these for ourselves. Our blindness to our own mortality and our blind hopes are given power through our mastery of technology. In the myth of Prometheus, fire gave humanity the power to give its ambition expression. A child’s ambition to be a king is limited by his limited power – he has no money, influence or power. But, humanity has the knowledge and the means to move its ambition from thought into action. We live at a time when the mantra is “if we can, we should”. The moral questions that ought to accompany technological advancement are either not given thought, or are judged with such twisted logic that no hesitation is ever given to our advancement. Our environment and children are suffering for the decisions we made in the past and I suspect our grandchildren will suffer similarly. Remember the story of the Tower of Babel? Humans got together and built a great city, and in the center of the city they built a tower in hopes of making a name for themselves (Genesis 11). God responded to this by saying, “Behold, they are one people, and they have all one language, and this is only the beginning of what they will do. And nothing they propose to do will now be impossible for them” (Genesis 11:6). God could see that humanity’s heart was corrupt, and when that corrupted heart was coupled with the incredible ingenuity of their hands, it would spell doom for them. What does all of this mean? Why even bring this up? I think there is a false belief among many of us that says that we are improving as a species. That as we advance in technology we are advancing in all areas. It is as if we are one day going to become immortal, that we will master the physical world and eventually rid humanity of all its rough edges. Disease, racism, poverty, can all be eradicated if we just have enough time. I think this belief is evidence of the second of the points made above – our blind hope. Depending on your worldview, you will think that humanity has walked the earth from 6,000 to 200,000 years, and regardless of which you settle on, the diagnosis is grim. If we have not managed to root our jealousy, murder, racism and corruption in this time (or even really advance in any of these areas), then why do we think more time will help? I think the myth of progress might be one of the greatest expressions of wishful thinking that we have yet manufactured. We would do well to meditate on our limitations. Our limited days, our limited abilities, and our limited knowledge, are all worthy of consideration. When we consider all of these things and follow them to their ends, we find that our limited natures mean that we can’t save ourselves. We have much power but cannot save our planet, we cannot save lives. We can prolong a life by showing mercy or by applying our considerable medical knowledge to the sick, but we cannot stave off death. Whether it comes in infancy or in old age, it comes, and we cannot stop it. We can keep the air and our rivers clean, but we cannot hold off the death of the world. This is premise behind the Second Law of Thermodynamics – we are all on running clocks. The Bible tells us that we are not in control of the things that matter to us most. We don’t control life or death. We don’t prolong or shorten the life of the earth through our environmental practices. We should care for our planet, but make no mistake, the world will come to an end when God says so, not when we completely pollute it. Take some time to sit in a quiet place and think about your limits and the One who is unlimited.